Charlotte Murphy, of Essex, says she ran into a wild parsnip plant in Bennington around the end of June that left her with second-degree burns. 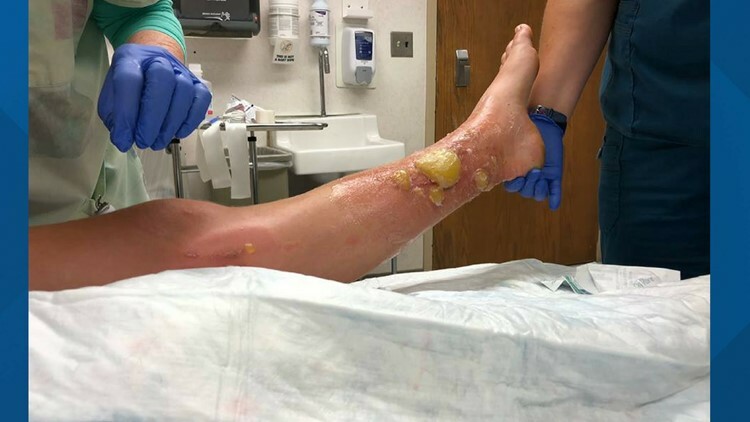 ESSEX, Vermont (NECN) — A Vermont woman says her brush up with a plant left her with painful, large blisters comparable to a second-degree burn. Charlotte Murphy, of Essex, says she ran into a wild parsnip plant in Bennington around the end of June. Murphy says she didn't realize the plant's sap had gotten on her skin, and the blisters that formed a week later became so painful that she was unable to walk. Murphy went to urgent care for treatment, and she says she will soon see a burn specialist for her injuries. Murphy shared her experience along with photos of the blisters on Facebook Saturday as a warning to others. Her post has since been shared more than 20,000 times.